Keith Ferris was born into the U. S. Army Air Corps, the son of a career Air Force pilot who served his country from 1925 through 1955. 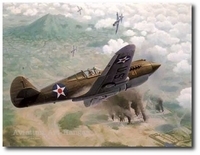 The artist grew up on the grass flying fields of the 1930s and matured on those of the 1940s in the midst of the massive effort that fielded the huge air forces that were to bring down the Axis Powers of World War Two. It never occurred to Keith that he would never serve as a pilot in the Air Force. While an aeronautical engineering student at Texas A&M, he moved to enter the Air Force as a flying cadet. He found that an allergy to some of the required inoculations had effectively ended that dream. He changed his career goals and, putting to work his life long experience drawing aircraft, he immediately joined the Air Force's Training Publications Unit at Randolph AFB as a civilian apprentice artist. Keith had chosen art as his way to stay close to the Air Force and his beloved flying machines. 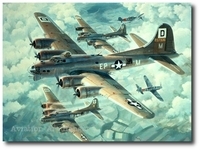 The dawn of his art career coincided with the 1947 establishment of the United States Air Force as a separate service. He left Civil Service to serve with Cassell Watkins Paul, a civilian art studio in St. Louis under contract with Air Force Publications. 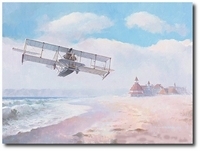 When the Air Force ceased its outside publications contracts, Keith moved to the New York market as a freelance artist to serve the advertising, public relations and historical documentation needs of airframe, engine and avionics manufacturers and their advertising agencies, aviation trade publications, the military and aviation museums. He continues to serve this clientele. Becoming a member of the Society of Illustrators in New York in 1960, Keith was introduced to its Air Force Art Program. He has served on SI's Air Force Art Committee for most of the years since. He served on SI's Board of Directors as Government Services Committee Chairman for over 15 years, as SI's Executive Vice President for two years, and continues as Honorary Government Services Chairman. A 47 year veteran of the Air Force Art Program, Keith has flown in and participated in the missions of almost every jet aircraft type in the Air Force, and done so not only in the United States, but in Europe, the Atlantic, Pacific, Middle East, Southwest Asia, the Far East, Southeast Asia, the Southwest Pacific and Antarctica. 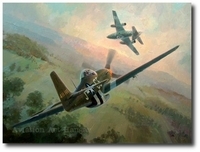 In addition to his administrative duties with the program, he has donated an annual minimum of six weeks of his time to the Air Force plus his 60 major paintings in the Air Force Art Collection. 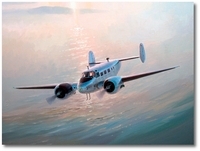 His 25 foot high, by 75 foot wide B-17 mural and 20 foot high, by 75 foot wide Jet Aviation mural in the National Air and Space Museum, as well as a large body of work in government collections and in civilian hands, attest to the wisdom of his decision to choose art as his way to stay near his airplanes. "Rauhbautz, Marie, Special Delivery Bonnie B"